Transcribed by Bob Currie, B.A., from “A History of Strathaven and Avondale” by William Fleming Downie, B.Sc., (1979). One of the immediate requirements of the first settlers in Strathaven was water. This was obtained at first from Powmillion Burn. At a later date the settlers dug wells in the ground beside their homes, to a depth below the water table level, so obviating the need to go to the burn. As the village expanded in size more wells were dug to meet the needs of the inhabitants, but water for washing horses and carts was taken from the burn. By the early 19th century about 200 families were supplied with water from private wells and about 600 families from public wells. Private wells were in gardens and public wells were erected on the side of the raodway or other suitable place for use of the general public and those who had no well in their gardens. Periodically the water from privat and public wells was analysed for purity, with varying results. Water in some of them was condemned for use, while in other cases conflicting reports were received. Some of the wells were open on top and water was obtained by dipping a pail or other container into the water. A few wells had a stone slab on top and water was obtained from a hand pump situated over the well. At other water points, the water flowed continuously from a small iron pipe into a stone trough. The closed well was safer and cleaner as it prevented anyone from fallin in. It also prevented pollution of the water by dirty pails or dishes. Wells were dug deep enough to pass belowe the water table, that is, the level at which water can be found below ground level. Wells were constructed round in shape to resist earth pressure and would be three or four feet in diameter and very in depth from sic feet to twenty feet. They were lined with stone and the lower part of the well had open joints in the stonewoark to allow water to enter the well. Some wells were not constructed deep enough and in many cases this condition allowed surface water to readh the well before it had been properly filtered in the ground. This was particularly the case if wells were sited too near the midden or other receptacle of waste, when illness and poor health were inevitable results of drinking contaminated water. In the Summer of 1886 there was a great deal of speculation in the village that gravitiation water would require to be installed, because of the continued poor reports of the water from the wells. By the month of March 18889 the Local Authority had two water schemes under consideration. One was at Glengavel and the other one at Burnhead on Kype. Many of the ratepayers thought that the existing wells in the town should be put into good order as there was always plenty of water. At the same time a drainage system for the village was being considered. This, of course, could not materialise unless there was also a gravitation water system for the proper operation and flusing of the drains, since for the proper operation and flusing of the drains, since drainage and water supply were dependent on each other. In June 1889, an engineer measured the amount of water available locally for the Strathaven water supply. “A report dated 8th June, 1891, prepared by Messrs. Leslie & Reid Engineers, Edinburgh, recommended that the District Committee should take powers to impound the waters of Glengavel in the Parish of Avondale and to construct a reservoir there, at a point opposite High Plewland Farm. The contract for the dam was let in March 1893 to Messrs. James Young & Sons, who had just completed the Talla Reservoir for Edinburgh Corporation. Work at Glengavel commenced forthwith. To mark the inauguration of the scheme, a marble tablet was inserted in the stone parapet of Hall’s Bridge near Glengavel, bearing the inscription “Glengavel Water Scheme, near this spot the first pipe was laid on 6th September, 1893, by Colin Dunlop, Esq., of Quarter, Convener of Committee. He having cast the pipe the previous day in Glasgow. Materials and equipment arrived required for construction of the dam continued to arrive at Strathaven Station and were taken to Glengavel Dam in large iron wheeled vehicles hauled by steam traction engines. All this extra traffic on the streets of Strathaven and on the Muirkirk Road had a marked damaging effect on the roadway. As a consequence of this , in November 1893, a quarry was opened at Maggie’s Lnowe, behind Colinhill Farm, equipped with stone-breaking machinery to supply roadstone for the reopair and maintenance of the affected roads. Throughout the entire time of construction of the Dam and laying of the 28 inch diameter cast iron water main to Strathaven, the Muirkirk Road had to be continually repaired. In the month of June 1894 Brown’s Bridge over the Avon Water near Strathaven was being widened and strengthened on the upstream side, to carry the water main from Glengavel Dam to Strathaven. During the same year water distribution pipes were laid throughout the village, in readiness for the gravitation water from Glengavel. By the month of October 1894 construction of sand filter beds near Glassford were well advanced. Water from Glengavel Dam which was a height of about 900 feet above sea level, first flowed to the filter beds near Glassford which was 750 feet above sea level. There the suspended matter in the water was filtered out and then the water flowed to Strathaven for distribution where the levels varied between 580 and 700 feet above sea level. Throughout the entire passage of the water from Glengavel Dam to Strathaven it flowed by gravity, from the higher level to the lower level, hence the term Gravitation Water. Test mechanical filters were also constructed at Redleeshill near Strathaven by Bell Brothers and Mather Platt Ltd. The filters operated for a few years and their use was eventually discontinued. They were demolished about 45 years ago. 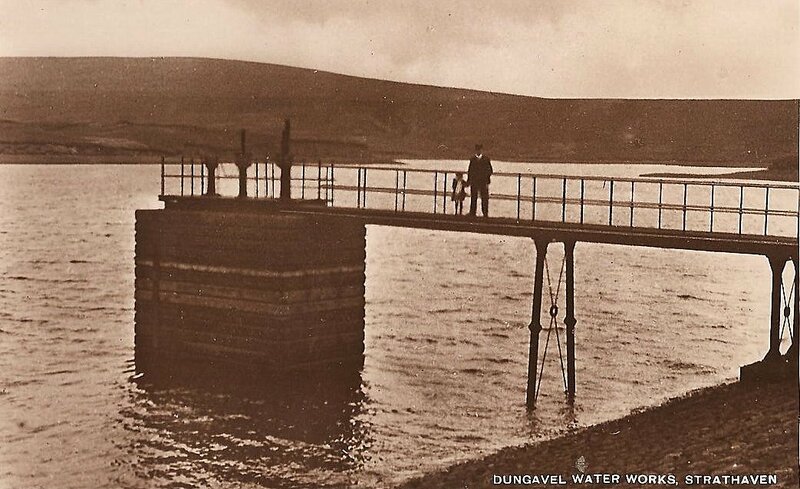 When the water distribution pipes were all laid Strathaven was supplied temporarily with water from a well sunk near the site of the earth dam at Glengavel and from an underground supply while the main reservoir was under construction. The first gravitation water readhed Strathaven in 1896. Among the early water installlations were those of William Cochran to his greenhouse and garden shed on Stonehouse Road just beyond the Town Mill and to James Kemp of the Crown Hotel. Some dificulties were experienced in the construction of the reservoir at Glengavel and the Dam was raised by relatively short lifts at a time and allowed to fill up with water to that level. The Dam level continued to be raised over the following years. In the month of May 1903 ti was further raised by nine feet and there was still no indication that the embankment was not absolutely water-tight. The Dam was of the gravity type, in which the weight of earth and clay kept it stable, the clay being used in the core to keep the structure water-tight. In April 1905 consideration was given to raise the embankment by a further twelve feet, which would give an additional capacity of 177 million gallons, making a total capacity of 446 million gallons. The work of raising was started in July 1906 and was completed the following year. In the ensuing years Glengavel Dam continued to meet the water requirements of the community, both in quantity and purity of supply. In the early 1930s a large reservoir was completed at Camps near Crawford. Some of this water was used to augment the Glengavel supply. Although Strathaven was adequately supplied with water, few of the outlying houses and farms in Avondale received gravitation water. They were supplied with water from springs or burns led into storage tanks and hence to the houses or faarms. In some cases, however, windmills were required to pump water to higher levels. This system of water supply operated successfully, except in period of drought or hard frost, when water had to be carried in pails or other containers from the nearest stream to meet their water requirements. This was the position, more or less, until the late 1940s when the Water Authority commenced laying water distribution pipes to the outlying houses and farms in Avondale, so bringing to them adquate supplies of good freshwater. (A History of Strathaven and Avondale: William Fleming Downie, B.Sc., (1979).